There have been numerous attempts, certainly, in the past to present proposals for resolving this dispute, but none has seemed to take hold. The revival now of Musharraf’s Four Point Formula which was widely discussed in 2006 has again been raised as a solution that offers the most promise of hope to those who have grown weary of the struggle and are willing to accept serious compromises in the interest of alleviating some suffering. Let us analyze these four points. Demilitarization is an option that was suggested by the United Nations and in particular by Sir Owen Dixon of Australia. 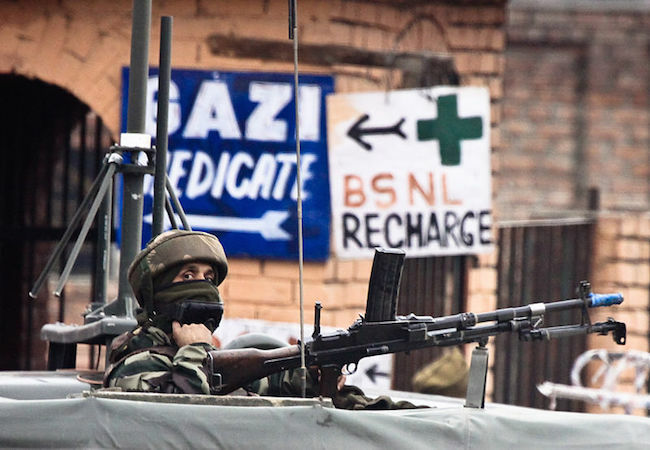 This has been the demand of the leadership of the Kashmiri resistance that demilitarization from both sides of the Ceasefire Line will pave the way for a serious and thoughtful solution to the Kashmir dispute. Yes, the Line of Control is in fact a line of conflict which needs to be eroded so that the people of Kashmir can move freely from one area to the other. But the problem arises when the ‘Four-point Formula’ says that borders cannot be withdrawn. That is a very loaded phrase. That means that the Line of Control should in fact be established permanently as an international border. Such an option is an insult to the intelligence of the Kashmiri people. The subject was brought up when I had an opportunity sometime back to meet with Congressman Gary Ackerman, Democrat from New York, who was the Chairman, House Foreign Relations Committee on South Asia. He was considered to be the friend of India. In fact, President Clinton, after having visited India, told Congressman Ackerman that he was more known in India than he himself (Clinton). Congressman Ackerman told me in 2000 that he had a proposal for the settlement of Kashmir. If we pursue it, he said, each party, India, Pakistan and Kashmir, will benefit. No one will lose. Each of them will be a winner. That seemed like a sound idea and I asked him to explain his proposal. To my astonishment, he proposed that the Line of Control be accepted as an international border. Self-governance, undoubtedly has broad meaning. Self-governance means freedom, independence and autonomy. It means that the people would be makers of their destiny. It also means that one has to be the shaper of one’s future. So, the term self-governance by itself is not an issue but the concept of self-governance within the parameters of Four-point Formula is. It is problematic because under this plan, self-governance excludes the option of freedom or independence. In fact it clearly says that the people of Kashmir will be given self-governance without independence. Will India retain the power to tax the Kashmiris? Will people have a hand in the politics and influence who has the mandate to rule? Will they pass new laws which infringe on the limited self-rule the Kashmiris possess? Where does self-rule begin and where does it end, if Kashmir does not possess sovereignty over its land? The drafters of the four-point formula have been quite conscious of the sentiments of the people of Kashmir. They knew that the resistance to foreign occupation that began in 1931 and continues until now does not accept de-facto rule by any country over Kashmir. Therefore, they wanted to play a linguistic game and came up with the idea of self-governance which is a deceptive and misleading term that gives an appearance of sovereignty without any substance. It is purely a mask. It prohibits further discussion on the subject of independence and promotes internalization of the Kashmir dispute. Without actual sovereignty for Kashmir, under the Four-point formula, the people of Kashmir will have to accept the supremacy and rule of India over their lives, and the possibility of that being eroded by whatever whim, fancy or circumstance may intervene in the future. Perhaps self-governance now, designed and managed by external powers, which is subject to the will of those foreign powers without due respect for the sovereignty of Kashmir and all the international protections that accompany it, has the appearance of a step in the right direction but on an extremely slippery slope. Self-governance is a mere illusion: what is given can be taken away, when it does not in fact include true sovereignty. Those who believe that the people of Kashmir should accept the Musharraf’s Four-point formula should be bold enough to say exactly what it is i.e., that the formula gives the people of Kashmir only choice and that is to be part of India. There are no ifs, ands, or buts about it. This is only a slightly broader version of Article 370 drafted in 1949 which today practically has become meaningless. Famed jurist and author, A. G. Noorani is correct when he said on November 2, 2009 (The Hindu), “The solution (of Kashmir) should be such that a Kashmiri leader could announce it in Lal Chowk.” I totally agree with Mr. Noorani. If a person genuinely believes that the Four Point formula is the only way out, let him announce in Lal Chowk that this form of self-governance is not what we were striving for. Self-governance is neither freedom nor independence. Self-governance is the declaration that Azad Kashmir is an integral part of Pakistan and Jammu & Kashmir that of India. Let there be a referendum and the people of Kashmir should get a chance to decide. If they vote in favor of the formula that verdict must be final and acceptable to all. However, I still believe that in order to reach an imaginative settlement of the Kashmir dispute, all parties concerned – Governments of India & Pakistan and the leadership of the people of Kashmir – will have to show flexibility. But in the Four-point formula the only party which becomes a sacrificial lamb and shows flexibility and makes sacrifice are the people of Kashmir. That should not be an option. The demand for self-determination is greater now than it has been in many years. It’s time for all parties to recognize the realities on the ground, see the need to include the Kashmiri leadership at the table, and begin to negotiate in good faith for the durable and permanent solution of the Kashmir dispute. Dr. Ghulam Nabi Fai is the Secretary General of World Kashmir Awareness.